On Wednesday, NASA’s Orion spacecraft is going skydiving. Or a dummy version of it is, at least. The space agency plans to drop what’s effectively a big Orion-shaped crash test dummy out of an Army C-17 transport plane flying at 25,000 feet to test its complex parachute system. 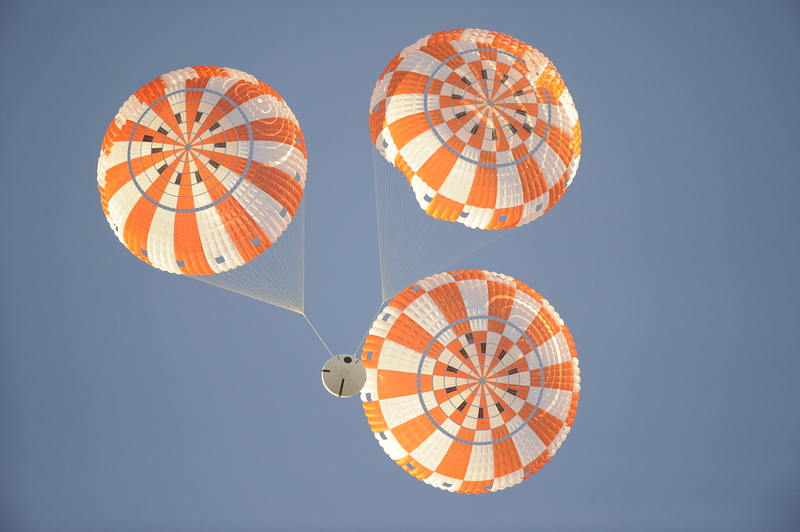 The test is NASA’s second of eight drops that will evaluate the Orion capsule’s parachute system before putting it in charge of landing people back on earth in one piece. Wednesday’s test is an extreme situation as well. NASA wants to simulate a descent astronauts might have to take on an aborted mission, rather than a traditional landing. The capsule will be traveling slower than usual — at about 130 miles per hour, rather than the usual 310 miles per hour it would be on a re-entry into the atmosphere. But the change in speeds is just another variable the agency needs to test for, and there’s no room for error in rocket science (or parachute science, in this case). The parachute system is a four-step system of 11 total chutes. First, three forward bay cover chutes pop out in the upper atmosphere. Second, three “drogue” parachutes come out at around 25,000 feet. The drogues are followed by three pilot parachutes at about 9,500 feet, which are basically just small anchors that drag out the final main parachutes, a triple-canopy of 116-foot wide kevlar-nylon chutes that slow the 8.9-tonne spacecraft down enough for it to land. NASA previously nudged a crewed mission on Orion back to 2023, but might be looking to fly two astronauts earlier than that, perhaps as soon as 2019. NASA sees the spacecraft as humanity’s best ride to Mars, so stay tuned for more exhaustive testing and exciting developments.